A single source for Engineering, Design, Moulding, Molding, Assembly, Cabling and associated services - Cliff™ Electronic Components. Please download our Engineering Solutions document (opens in a new window). Over recent years, the need for custom design products has increased. Whereas, in the past, companies have fully designed and produced their own assemblies, the trend has been to outsource large parts of this work to specialised specialized firms for mouldings, moldings, assemblies, leads, cables and machined parts. Most specialist components suppliers only deal with perhaps one or two of the manufacturing disciplines required, still leaving the customer to deal with four or five other suppliers. This involves the main customer still handling logistics, ensuring all parts are received at the right time, holding stocks and finally sending the complete package to the assembly subcontractor. This can often be a logistical nightmare. By using our own manufacturing facilities, skills and expertise, expertize Cliff™ can provide the solution. All stages of procurement, storage, manufacture, warehousing, scheduling and despatch are within one company and under one UK control. We at Cliff™ will provide a solution from design to despatch, eradicating all manufacturing and logistical problems. Since the 1970's, Cliff™’s understanding of the need for high quality, standard components at economic prices is well known in the UK, Europe, the USA and the Far East. 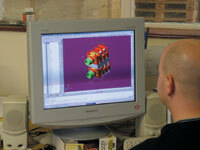 Providing excellent technical support and fast reliable lead times have been essential to our growing customer base. Cliff™ has extended its manufacturing capability in the UK with the addition of two-colour moulding two-color molding facilities and insert-moulding insert-molding machines. Our factory in China has renewed its ISO9000 Quality Control Management System. Cliff™ Components Technology Co. Ltd. (CCT) is dedicated to making Cliff™ high volume and customised customized products. A team of engineers well versed in moulding molding technology, metal working, cable and assembly work are employed by Cliff™ to assist in the design and production of customer products. Working, in the main from CAD and IGES files, they are able to arrange for SLA models to ensure that customer specifications are met and are viable. The vast knowledge gained from developing Cliff™’s standard connector range enables us to advise on design to ease production and to modify products to improve the quality and serviceability. Cliff™ have specialised specialized in the production of plastic injection mouldings. moldings. We offer a wide range of services that include a high quality, high volume production capability with the flexibility required for small batches. Our production machines are capable of moulding molding across the spectrum of thermoplastic materials and range up to 250 tonnes with shot weights of up to 500 grms. To complete our moulding molding facility we are able to provide tool making, ultrasonic welding and multi colour color printing. To compliment our mouldings, moldings, Cliff™ have introduced the manufacture of various types of metalwork. 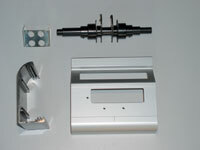 We are able to provide auto lathe production, press work and extrusions. These faclities are limited to producing metal parts to fit with our mouldings moldings or assemblies and do not form a “stand alone” set of component parts. Cliff™’s assembly lines enable us to provide simple or complex devices to customers’ specifications. 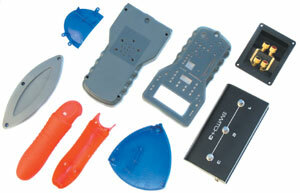 From fitting terminals onto metal plates to devices requiring PCB assembly and keypads. All are within Cliff™’s range. In addition we undertake numerous cable assemblies fitted with connectors and/or stripped ends, test leads fitted with probes and crocodile clips or the familiar mains cables.